*Note- I wrote this post a year ago in June of 2017. 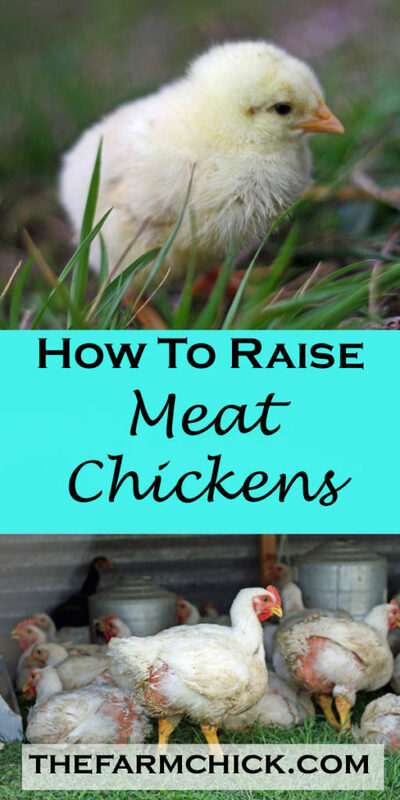 It’s an overall comprehensive post on raising meat chickens. My new chicks for 2018 will be arriving this week, so I plan on blogging about it step by step to really give you an in depth look at how we do it! 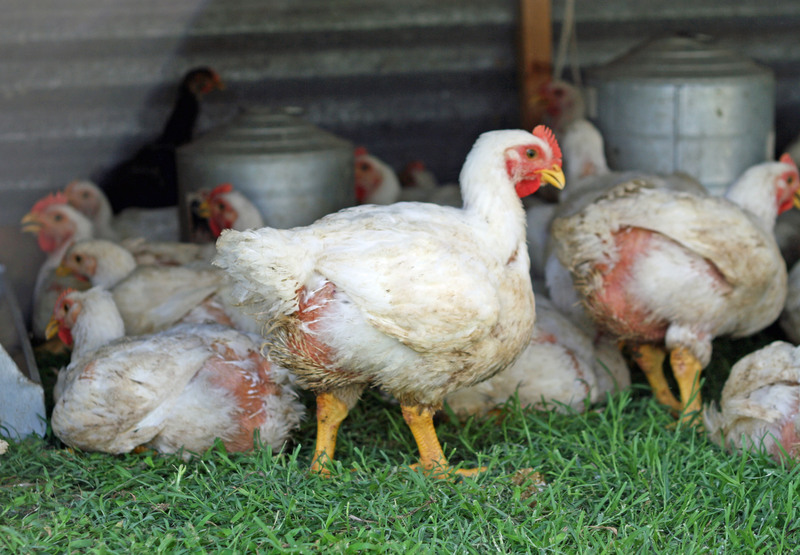 Have you ever thought about raising your own meat chickens? I’m here today to give you the lowdown and my personal experiences, both good and bad! I raised my first batch of meat chickens (also known as broilers) 8 years ago. I had been buying organic chicken whenever possible (which was difficult because our local grocery stores didn’t carry anything of the sort, so it meant a longer trip to a health food store to buy chicken!). I began thinking, “Gosh, I live on a farm…. I’m an intelligent resourceful girl. Surely I could raise my own!” and thus began my journey into raising meat chickens! I first read the book “Pastured Poultry Profits” by Joel Salatin. He’s the foremost expert on raising broilers the right way! My first year I raised 17 chickens. The next year I raised 35. And then year after that I raised almost 100 and sold 30 of them! It blossomed into a thriving business and for two summers we raised and butchered 800 chickens! The last few years we had to cut back due to variety of circumstances (major house remodeling and things were difficult for awhile with Reece) but we always manage to do a hair over a hundred every summer. *Update: I have 225 arriving tomorrow for our 2018 batch! 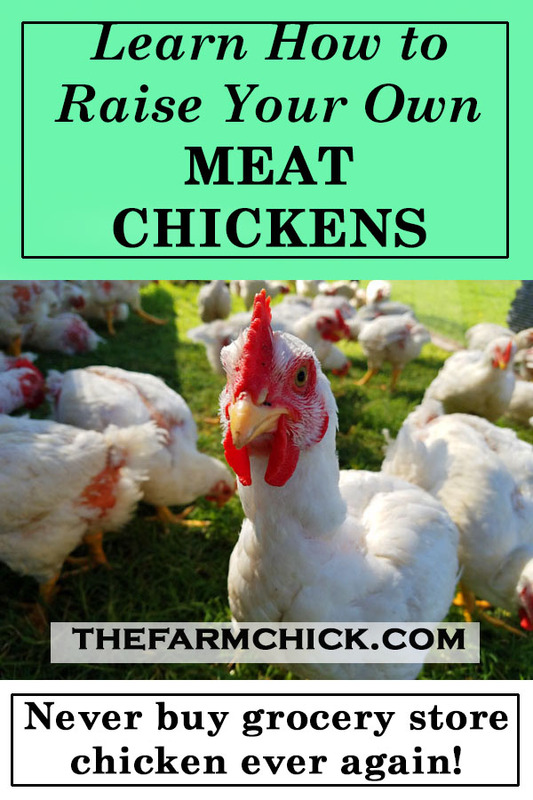 Without further ado, here’s all of my advice and know-how…..
Before you ever buy your first meat chicken, you need to read Joel Salatin’s book. Trust me. He has more in that book than I will ever be write on this blog! Its fairly old and the prices of feed and such are off, but the knowledge he gives is always relevant. First things first…. do you know what meat chickens are and how they are different from layers? I’ll be quick- you need to get the Jumbo Cornish Cross. These birds have been bred to have lots of meat and grow fast. They will be ready to butcher in 6-8 weeks! If you order a dual purpose or heritage chicken, it will not have the same amount of meat, grow a lot slower and be much, much harder to butcher! In my next post on butchering, I’ll explain more. For now, just order the Jumbo Cornish Cross. Layers are chickens that are used primarily for egg production. They do not produce the amount of meat on their bodies that a meat bird will. Dual purpose birds are larger chickens that the pioneers would raise for both egg producing and butchering. If you are wanting the kind of meat you get in the store (but better, of course, because they will be raised in a more ideal environment! ), then you want the Jumbo Cornish Cross. See the legs on this guy? If you compare him to a laying hen (or rooster), he has more meat on him, hands down! The next thing is I highly recommend ordering your broilers from Murray McMurray Hatchery. I had tried several other hatcheries over the years that were less expensive, but the chickens didn’t seem nearly as healthy. I know of some people who buy them from the local coop or farm supply store, but they never have them when I’m wanting them, so that’s why I prefer just ordering them. The chicks come straight to your post office. Pretty cool, right? I must warn you, there can be shipping problems. Chicks are tiny and fragile and if there is a bad draft or horrible heat, you may lose a few or a lot. It’s a risk. Just this year I lost almost 30 the day after they arrived due to shipping stress. If that happens, call the hatchery. McMurray is great about either sending you replacements or refunding your money. There are a few similarities and differences between Jumbo Cornish Cross chicks and regular chicks. You will obviously need some sort of brooding area with a heat lamp and bedding (I’ll assume you have done your research on raising chicks in general by this point.) The chicks will need a fresh water source and feed. And that is where the similarities end. If you have ever raised chicks before, then you know they like to scratch around their bedding from day one, right? Well, broilers aren’t as ambitious. They will scratch and peck some, but they will not keep their bedding turned over and you will need to stir their bedding around and add fresh bedding to their brooding area almost every day. They also poop a LOT! Much more than regular laying breed chicks. Combined with the lack of scratching, their brooder can get stinky and nasty in a hurry!! So, you must stay on top of that. These guys are 4 days old in this picture. See how many of them are sitting? That is a big difference between broiler chicks and laying chicks! They are also not very smart and will pile on top of each other if their is not enough of the heat source to go around. I know this from personal experience. So make sure you have enough heat lamps to accommodate the number of chicks you have. 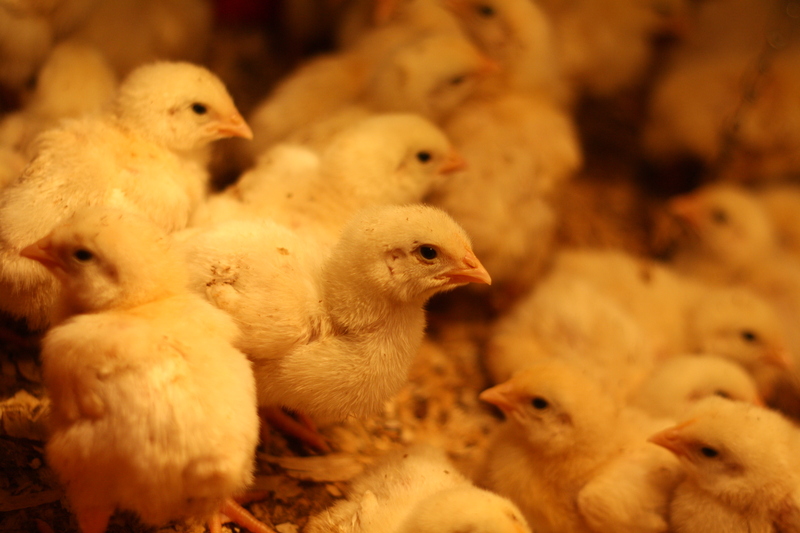 Broiler chicks need high powered feed and supplements from the get go or you could experience leg issues or other health problems. Regular chick starter has 18% protein. I recommend starting these chicks out on a high quality high protein (22%) meat bird feed. Also, I add kelp to my feeds and a probiotic if I’m mixing my own and not buying a premade meat bird feed. Also, McMurray gives you the option of a vitamin pack called “Broiler Booster”. I usually get a package that I put in their water for the first couple weeks until I can get them out on grass. Finding an organic broiler feed that won’t break the bank can be a big issue depending on where you live in the good ol’ US of A . We live in southern Kansas in the middle of GMO country, so I try to get the lesser of all evils and compromise. I have tried several different feed options over the years. I’ll tell you what I’ve done and then you can use one of mine or research and find your own options. My favorite and the most convenient option that I use (but also the most expensive!) is Naturewise Meat Bird feed. I can find it at Orscheln’s or other farm supply stores. It has some great additives in it, including probiotics and I think my birds seem the healthiest when I use this. It’s not organic but I love what it does to the chickens! Their legs and fat get nice and yellow and their livers are a beautiful dark, dark red. I seem to have fewer issues all the way around when I use this. On the flip side, it’s expensive- almost $15 for a 40 lb bag. I’ve bought it in bulk (by the pallet) before but it was difficult dealing with our local store, so I only did that for one season. If you are raising just a few birds (50 or less) I would probably recommend this feed. Orscheln’s also carries a store brand meat bird feed that I tried on one batch. I would not recommend this! It was cheaper and I could tell. My chickens were not as healthy and when we butchered, we noticed that their livers were pale and sickly looking. Another option I have used is getting my feed custom mixed at our local coop and buying it by the ton (literally). The advantage of this is cost and I could add my own kelp and probiotics to it. I also know that milo is not a GMO so I had the coop use milo as my base (the main ingredient) and then they added some calcium, salt and soybeans (*Update: I’m trying a half fishmeal, half soybean meal in my feed this time around! It increases my feed costs to about $12.50/50 lb bag, but by adding fishmeal, I’m decreasing my GMO’s in my feed and adding some healthy omega 3s. I’ll let ya know how it goes!) to it (for protein). I just told them what I wanted my protein level to be and that’s what they did. This is what I did for about 3 years and it worked pretty well. It’s not organic, but I was able to minimize the GMOs that were added to it (soybeans being the only thing). The disadvantage to this is you must have a way of handling it. I had to go to the coop and get weighed and loaded. Since we have a farm and equipment, we rigged up a couple different ways for me to do this and it worked for us. (*Update: I found a branch of our local coop that will bag the feed for me for a small fee! Totally worth it!) I would only recommend this if you are raising hundreds of chickens every year (which we were)! This year (2017, so last year) I bought bagged feed from a local coop, but had to do a partial mix on my own. They did not carry broiler feed (many times they are medicated, which I do not want!) but they had a layer feed and a game bird feed. The layer feed was 16% protein and the gamebird feed was 29% protein, so I mixed them (using a 50/50 ratio) together using our small cement mixer for a 22% mixture! I also added my own kelp and probiotic. I chose this route because of cost (it averaged $7.50/50 lbs) and ease of handling (I currently do not have a way to handle bulk grains and Jeff was too busy to make me one!). I was also only raising 110 birds, so I didn’t mind running to the coop ever couple weeks for feed. The major disadvantage to this was the base was corn. Knowing what farmer’s grow around here, I’m 99% sure it was genetically modified. I was pleasantly surprised, though, when we butchered. I had very few death losses related to poor health and the livers were a nice dark red. The fat was also a surprising butter yellow. I will be doing a weekly post of raising our meat chickens this year so you can get a detailed play-by-play and I’ll give you more exact feed options and what we did and what we thought at butchering! OK, moving on from all the feed information…. The final, but possibly one of the most important things, I do when raising meat chickens, is put them OUTSIDE! I keep them in the brooder house for 2-3 weeks, but after that I put them in moveable pens in grass. This year was a bit different because our pens were shot (after 6 seasons of sitting outside they had broken down and were unfixable!). Jeff designed me a new pen, but didn’t get it finished in time, so my broilers this year ended up living in Lindy’s old 4h goat pen! They had plenty of grass and shade until the very end. The last few days were quite stinky and nasty because of rain and lack of grass! The biggest reason for putting them out on grass is it increases their health and nutrition! God designed chickens to be outside eating about everything. They are actually omnivores, not vegetarians and they should have the option of eating grass and bugs. Its a wonderful circle- if your chickens are healthy, then their meat will be better, which means you gain more nutrition when you eat their meat! It will also decrease your feed costs if they are eating grass and bugs, too. I prefer moveable pens for several reasons (Joel Salatin goes into great detail about this in his book!). 1 It distributes out the manure so you minimize flies and overall stinkiness. 3 If you are trying to improve your grass or pasture, this is a great way to help with that! We built our pens using Joel Salatin’s overall basic design. After using them for 6 years, we have some strong opinions on them! First, we used barn tin for a partial side and top. That does not work well with hot, humid Kansas. It just traps the heat and it’s very difficult to keep very large broilers alive. Second, we used chicken wire around the rest of it. Bad idea. Did you know raccoons will just reach in and pull pieces of the chicken out until he’s got it all? Talk about brutal! After we lost dozens of chicks that way one year, we covered the pens with hail screen. They were fairly easy to move using a homemade dolly, but it was very time consuming moving mutiple pens every day. So depending on your weather, you many want to somewhat customize your own pen. Just know that your broilers will need shelter from bad weather and they don’t like direct sunlight so you’ll need a big shady area for them. Our pens were 8ftx12 ft and I could fit 60 broilers in them. *Update: Jeff will have my new pen done soon, so I’ll take pictures and let you guys in on the pros and cons! OK, that is how you raise meat chickens, in a nutshell! I highly encourage you to do a lot of research and find someone you know who has done it before so you can ask questions! Or, ask me- I’d be glad to help! On that note, what questions do you have about raising meat chickens?? Any tips or tricks?